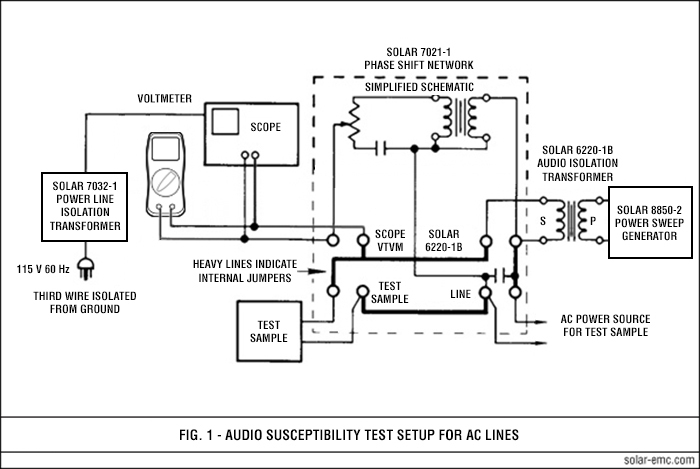 The Solar Type 7021-1 Phase Shift Network is used to phase out the primary power frequency without disrupting the injected frequency as seen on an oscilloscope during conducted audio susceptibility testing. The network prevents the power frequency from reaching the indicating device, but doesn't interfere with the normal power connection to the test sample. Properly adjusted, it has no effect on the injected frequency, so the voltmeter or oscilloscope will indicate the injected level. It contains variable resistance and capacitance in a bridge-type circuit which is manually adjusted for null before the injected signal is applied. The Type 7021-1 does a fine job on 50 Hz, 60 Hz, and 400 Hz power lines in either 115 V or 230 V single phase operation. The various terminals on the Type 7021-1 are interconnected internally as indicated by the heavy lines on the panel (see Figure 1). These connections are capable of carrying up to 50 A of power current. For power currents up to 200 A, the Solar Type 8121-1 Adapter can be plugged into the terminals of the Type 7021-1 unit. The adapter provides 3/8" threaded studs for carrying the larger power current to the test sample. (The adapter must be ordered separately.) Safety precautions must be observed since all power terminals are exposed. The operation of the Type 7021-1 Phase Shift Network is relatively simple. With the audio source connected, but its level reduced to minimum, adjust the resistance elements (the two upper knobs on the Type 7021-1), and the capacitive elements (the step switches) for a null or minimum indication on the oscilloscope and voltmeter. There is some interaction of these controls and when one is adjusted, the other should be readjusted and this action repeated several times. With careful attention to this, it is possible to reduce the levels to below 300 mV on the voltmeter. Nulling varies with power lines. Then, the audio source can be increased until the voltmeter indicates the voltage required by the susceptibility specification. In the test setup shown in Fig. 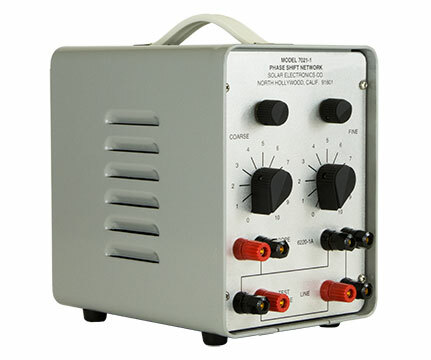 1, the purpose of the power line isolation transformer, Solar Type 7032-1, is to eliminate the power ground or chassis earth connection of the voltmeter and the oscilloscope. The chassis of these units floats on the power leads and must be isolated to prevent short circuits. Operating personnel should avoid touching the case or chassis at the same time they are in contact with earth connected items. Cautionary note: If the intended application of the Type 7021-1 is an attempt to meet the specs of MIL-STD-461-D/E/F, note that per the Appendix of 461-E, phase shift networks "may return the incorrect value of the ripple and are not acceptable for use". Plugs into the terminals of the network and provides heavy duty terminals capable of carrying 200 A to the EUT. Used when the EUT draws in excess of 50 A. It provides connections to a parallel blade receptacle with a U- shaped grounding pin. The receptacle is identical to that used in the USA for power connections. When the EUT contains a standard power cord, the cord can be plugged into the receptacle. To meet the needs of our clients, Solar Electronics Company engineers are in the lab every day. If you don't see a Solar product that suits your application, please send us your specifications so we can provide a solution. Do not ship to Laurel Canyon address. All Solar Electronics products are made in the USA. ©2018 Solar Electronics Company. All rights reserved.